This home was built in the 1920s (VERY old for Atlanta), so it probably has a unique floorplan. The above two pictures are from the same room. I love the symmetry of the lamps, the contemporary art work, and detail on the window treatments and chairs. Another beautiful room. Again, great contemporary artwork and furniture. I like how the fabric on the wing chairs, the pillow on the sofa, and the bowl on the coffee table all carry the chartreuse color throughout the room. The fabric on the windows is one of my favorites - I believe it is from the Jim Thompson line - and I love the sunburst mirror between the two windows. A beautiful home office. Great color on the walls, and look how the chairs are done: painted black, with white on the front and black and white stripe on the back. Perfect for a room in which they are seen both from the front and the back. 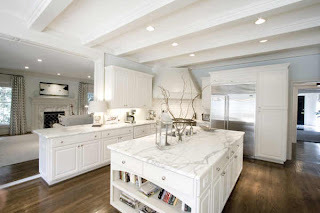 I think this kitchen is amazing. Generally I like kitchens to be in outside rooms, but this one is so light and bright I could be very happy cooking here! Since it is an old home that has been remodelled, I imagine that the family room off the kitchen was added in recent years. Here is a close-up of the family room. This color of blue is one of my favorites, and I love the combination of brown and blue that is used in this room. It is done with a very light touch. The mirror over the console and the series of framed photos complete the room so beautifully. This is my favorite room in the house, the master bedroom. It is absolute perfection. 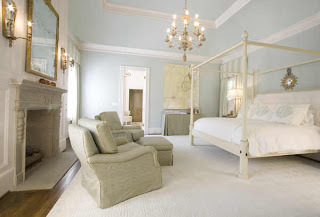 My favorite colors in the bedroom - pale blue and white - done so beautifully. I like the touches of gray here and there, and the chandelier is the perfect touch. And that bed! The headboard looks upholstered (based on the tufting), and I really like the finials at the top of the posts. Does anyone recognize this bed? This is exactly the kind of bed I would like to have! The other bedrooms are striking too, with lots of lovely details. All of the rooms are done to perfection. In my own home, I have a few rooms that are completely decorated, but I also have a few rooms that are not done, and are furnished with old furniture from my in-laws. It would be nice to have a completely decorated house! Finally, here is the back yard. Large, flat, with a beautiful pool. 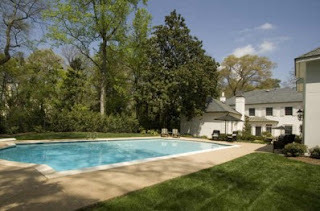 This house is in the best part of Atlanta, the heart of Buckhead, on a 1 acre lot. How much, you ask? Quite reasonable for the area: $3.495 million. Unfortunately, the listing does not note who the designer is (as Atlanta listings often do), but clearly it is someone with a lot of skill and talent if this house is any indication. Post script: Margaret Bosbyshell is the talented designer of this home, which is featured in Atlanta Homes and Lifestyles May 2009. That is absolutely my style of house right there and my favourite feature is definately the front door! I've been in the house and it's great. Dorothy Draper was in the inspiration for the interior. Margaret Bosbyshell is the designer. VA, it is a great house with lovely style. POC, thank you SO much for that information!!!! I have never heard of this designer. She is very talented! Oh yes I'll take it! The house is gorgeous. The only con to me is the family room. It is a little too white and sterile, and could use some contrast, perhaps in the rug. But of course this is just being nit picky. The house overall is fantastic. Ok so how can I get a closer look without coming to Atlanta? I love what I can see but would love to see it in more detail. I even googled the designer with no luck. omg- this is gorgeous!!!! it's so YOU! I wish you could buy this - you'd be quite happy here I think!hahah! I Love this - it's gorgeous. Who is Margaret Bosbyshell - does she have a web site? I love this house, and I have never heard of this designer. 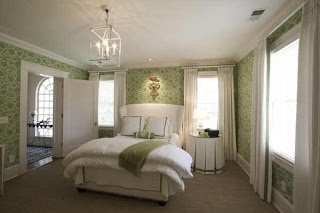 But, as I have said, I tend to pay more attention to rooms that I like vs. designer names. Often houses in this price range have a virtual tour. This one is new to the market, so it may have one in a few weeks. CDT, interesting that you say this house is so me...the master bedroom and kitchen are totally my taste, the other rooms are so beautiful and pulled together but not quite what I would do. I like a bit of the French touch in there! But, as soon as I saw this listing, I was smitten. The interior is so cool and serene. It's beautiful! Gorgeous HOME! Lovely, fresh and light -- especially on those hot humid summer days! Must remember to buy lottery tickets! LOL! Jan at Rosemary Cottage which is far from lovely, fresh and light these days! What a gorgeous house! The kitchen is perfect. I really like the interiors. I could move right in...if I had the money and lived in Atlanta. Gee, sorry to say, but from a male perspective the meme here was to strong. It looks like a single, x-ray, Jean Harlow masterpiece. Can you imagine the owner's reaction to a visiting three year old asking for an oreo? OMG the House is GORGEOUS Inside and out! Gorgeous facade, gorgeous furnishings, spacious, and a WOW kitchen. You've got a great eye! You have impeccable taste as usual! 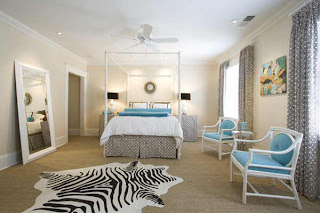 The bedroom is perfect and I love those office chairs you pointed out (I didn't notice the backs!). 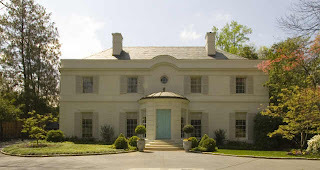 Gosh, Atlanta homes like that usually disappoint me on the inside, but that one is amazing! Those interiors are wonderful. Wow.. what a beautiful home inside and out. The decor is amazing. Thanks for sharing....very inspiring. beautiful darling! I love the front door, too. but that kitchen and master bedroom really stole my heart. I just adore the general whiteness. must be the OCD in me ;) beautiful! I'm in Atlanta, and I know exactly where this house is! The facade has been one of my favorites for years, so it's great to be able to see the interior. Thanks for posting this. This home was originally a farmhouse and was built in 1900, it was later renovated and the entry was built by Neel Reid. It is listed with Beacham & Company, REALTORS with Linda Williams and Neno Schildgen. It is also on the cover of the new Beacham Series, which came out Tuesday. Also, these are pictures I took. Thanks, Blayne. I always try to give credit to the photographers, but most real estate listings do not note the photographer. I have edited the post with a credit to both you and Beacham.